Tablet Growth is very high – growing at 52% year-over-year which shows this market is growing very rapidly and opportunities will increase in the future for the tablet market. In the future companies will likely not just think about making a smartphone app but a tablet app as well. 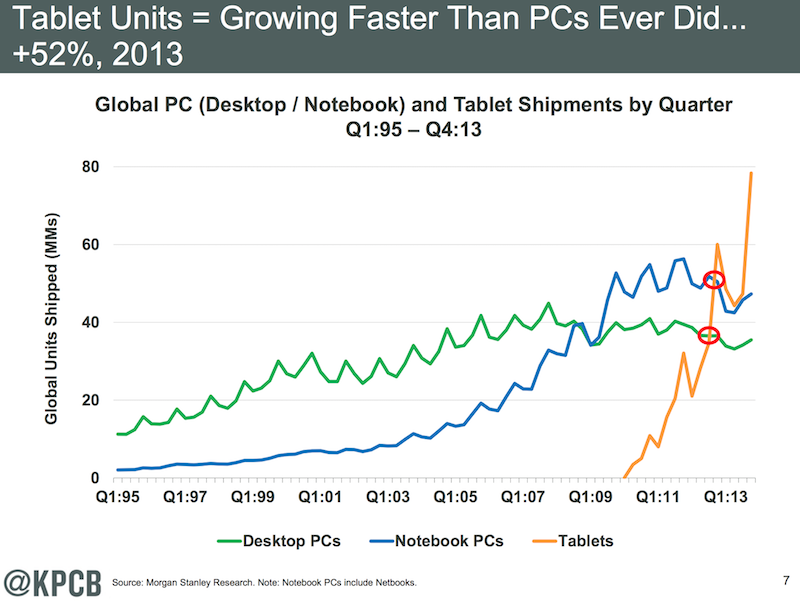 Also, tablets are growing faster than PCs ever did in terms of adoption and that growth doesn’t seem to be slowing down. Smartphone subscribers are still growing strong at +20% with fastest growth in markets like China. Smartphones are replacing non-Smartphones worldwide. This means Apps are becoming the norm of how users receive content. This is because smartphones users spend 86% of their time with apps (and growing) and only 14% on mobile websites. Mobile data traffic is growing at a rapid speed of 81%, where video is a very strong driver of data usage. This is also driving cell providers to expand their data offerings to increase speed and data in their plans. The future is bright for mobile devices worldwide as connection speeds continue to improve making smartphones and tablets even better to interact with. In terms of market share worldwide, it is clear that iOS, Android and Windows Phone are taking most of the market share. BlackBerry and other platforms are suffering in terms of losing market share. BlackBerry is refocusing on the enterprise which is probably a good idea the market share is listed below. 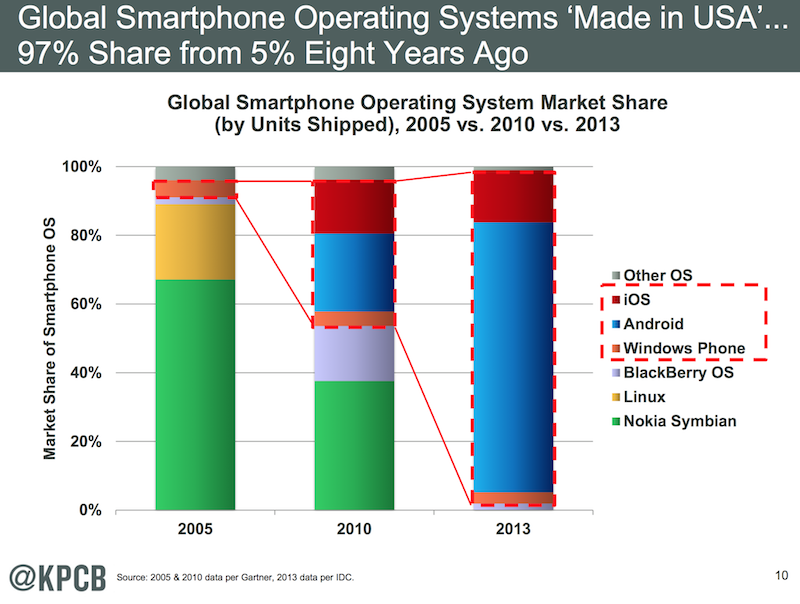 Also, Android is dominating in terms of pure market share. App Revenues continue to rapidly increase over time. 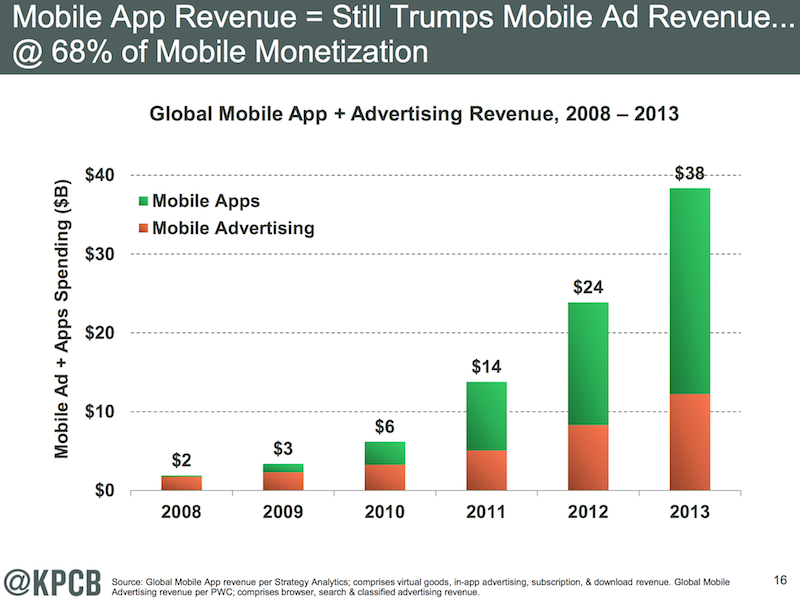 Money made through ads is decreasing as app-revenue models are turning towards the In-app-purchase model. See chart below. 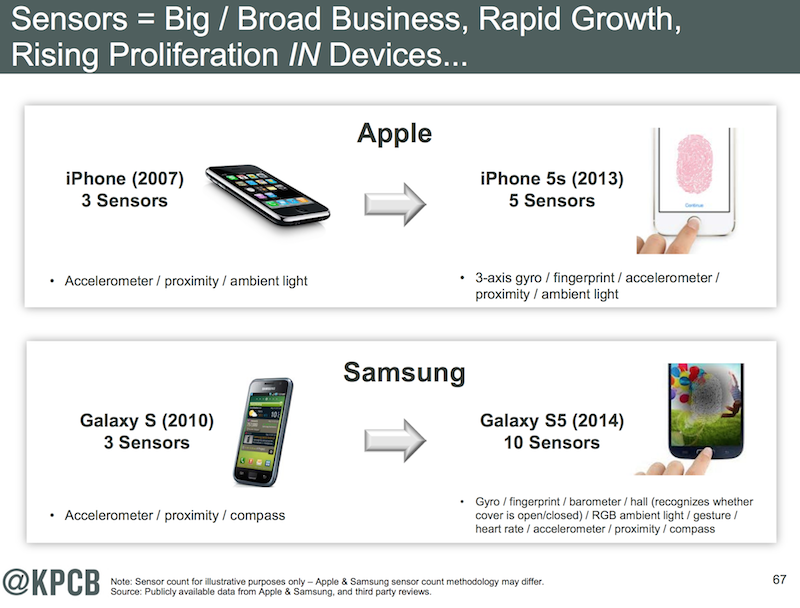 The number of sensors on Smartphones has continued to increase over time. The original iPhone in 2007 had 3 sensors. The iPhone 5S has 5 sensors. For Android devices the growth has been even larger. The Galaxy S in 2010 had 3 sensors and the new Galaxy S5 has 10 sensors. Expect this trend to continue in the future as smartphones continue to have a greater number of sensors over time. These sensors allow the phones to be used in new an previously unexpected ways in future applications. We think that these new sensors will be used by enterprise in enterprise applications to great effect. In terms of volume sold phones and tablets are selling at a much higher rate than PCs and are likely to replace them in the long run. Wearables may be an important category in the future as well but we will see what the future brings in terms of new technologies in that area. 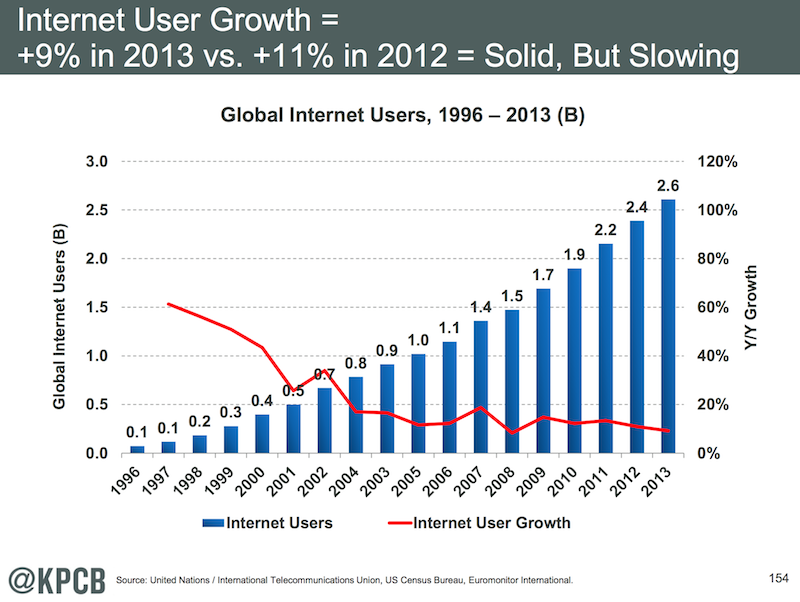 The internet growth itself is stagnating now with <10% growth which is quite a bit less than the historical average. 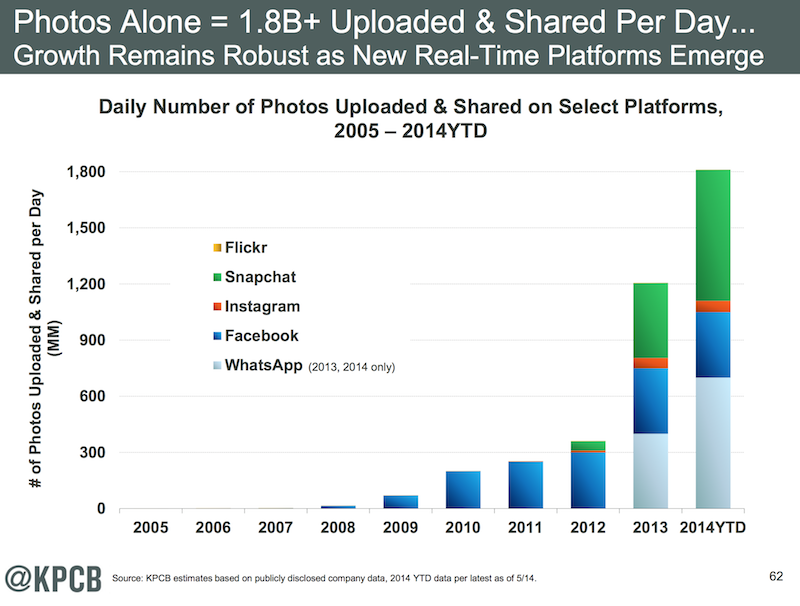 The number of items shared on social media is increasing at an incredible rate. See the chart below for details. We think this will continue to be a strong component of the apps we build. Connections to social media and the ability to share what you care about with others when apps are targeted to consumers. Note that Snapchat for example is exclusively mobile. Also, social distribution happens quickly: The average article reaches half total social referrals in 6.5 hours on Twitter, 9 hours on Facebook. YouTube and video growth remains strong which helped to push one of the trends above namely the growth in data usage over mobile.